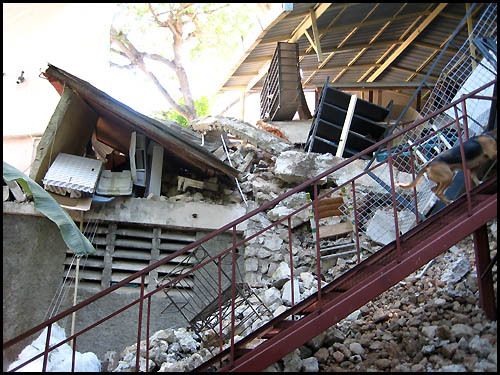 Photos of the results of the earthquake at our workplace in Haiti are shown below. Aug. 3 - As of now, we have our electriciy restored, but we are still working on rebuilding our work area, which had been badly damaged. January, - Our Haitian metal art gift and home décor business is located in Port au Prince, Haiti, which suffered a devastating earthquake on January 12. Our home was totally destroyed, but the apartment adjoining the property is still in good condition. 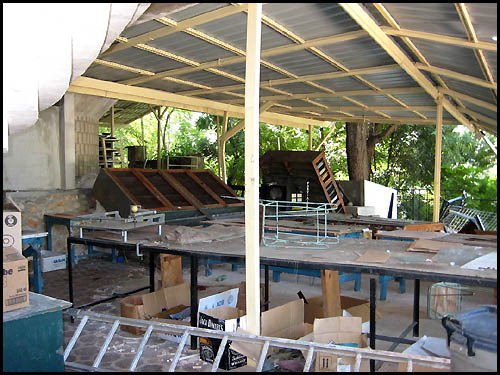 The work area, where we do our metal cutting and painting, was weakened and 50 - 70% destroyed. Most of our Haitian workers lost their homes. Several days after the earthquake, we set up tables outside and called our people back to work. We have been working at a somewhat normal pace and have been giving them coffee and bread in the morning and a good sized meal at noon every day. Gas, food and water are difficult to find, but after much searching, we have been fortunate to find what we need every day. (“Give us this day, our daily bread.”) The shipping port and airport are closed to everything except emergency supplies, but we are continuing to fill our orders and will be sending them, as soon as flights become available. There is no public electricity, but we have a small generator that we can run for short periods, as we find gas. On occasion, we have access to the internet, so we are keeping up with our orders as they come in. We hope that you will bear with us during this very difficult time. It is very important that the Haitian people have a source of food and income. We are doing our best to provide that for them. 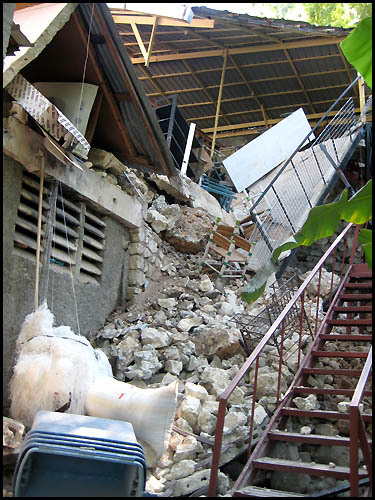 Please do not let this Haitian earthquake stop you from placing an order, but instead, please consider it as an opportunity to help employ and feed the Haitian people who need so much help at this time. 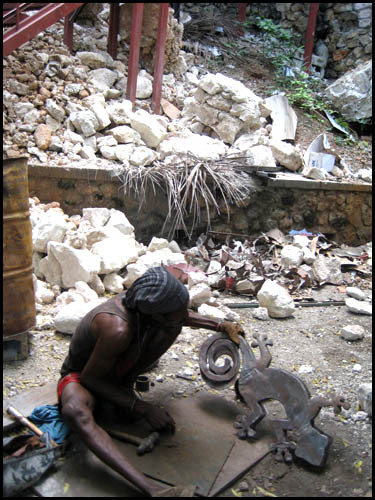 Below are photos that we have taken of the results of the Haitian earthquake where we make our Haitian steel drum metal art. Some of our artists are at work on the driveway, as we continue with our work after the terrible earthquake that struck Haiti on January 12. The men in the orange shirts are repairing the fallen rock wall and gate posts. The back half of our work area collapsed. This upper area was a lovely, open air space that was surrounded by large trees, with a pleasant breeze flowing at all times. Shall we say...... "It was a cool place to work!". The side of our work area. 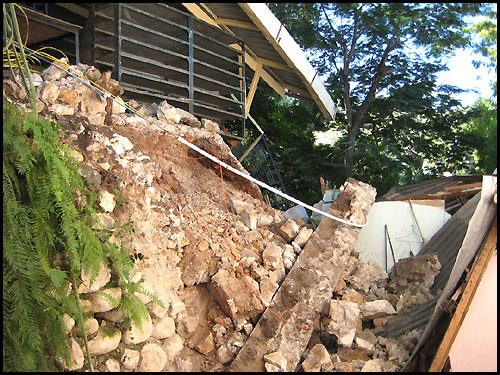 The rock retaining wall gave way. Inside of the work area. Shelves, tables, chairs etc. were broken, tipped, scattered and many pieces fell off the back part of this large room. Another view of the fallen work area. 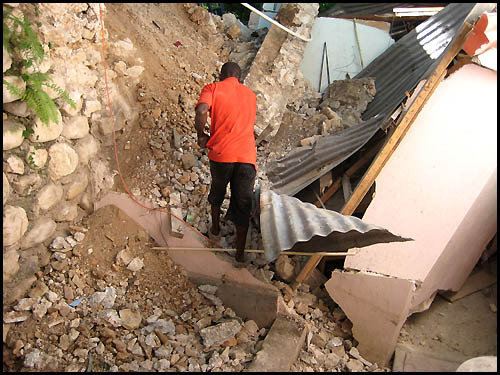 Each day we continue to clear up the rubble caused by the January 12 Haitian earthquake. We have employed men to clean up and men to rebuild. After having been in Haiti for over 25 years, we have no intension of stopping now, when employment is needed now more than ever. In addition, we love working with Haitian art. Cleaning up a fallen rock retaining wall and part of a storage area. All of this needs to be rebuilt so that we can continue. Inspecting the damage and planning for the future. One of our metal cutting artists continues to work beside the fallen rocks. 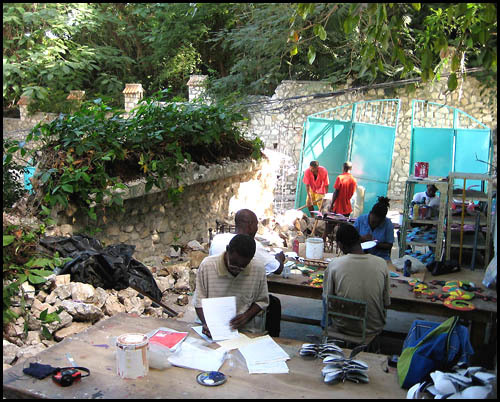 Every day we are cleaning up more and more of the area to bring it back to the comfortable work-place that it used to be before the Haitian earthquake. It is important that our people continue to work so that they can support their families during this stressful time. 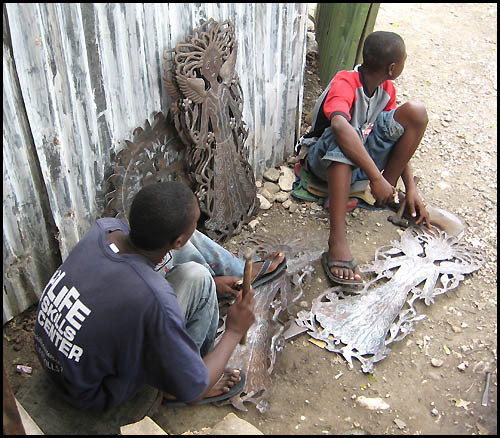 Haitian metal artists working on metal drum wall decor. 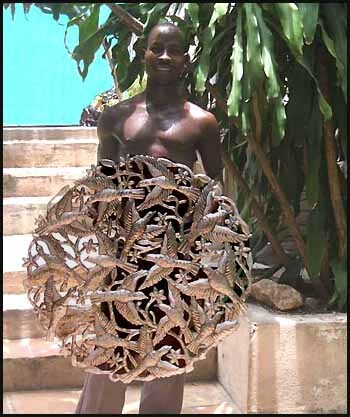 A finished Haitian metal art wall hanging, proudly displayed by one of our metal artists, Elius St. Louis. I am so happy to hear that you are well! The situation in your country has been devastating to watch from here and I can't imagine what you are going through. On the island where I live, the firefighters were so overwhelmed by the aftermath of the earthquake that they held a "boot fundraiser" where they stood outside every retail outlet with either a boot or helmet asking for donations. I have never seen such an outpouring of donations and concern before. Please know that the world is praying for all of you everyday and sending donations and aid as quickly as they can. My order seems unimportant in the face of everything but I am so glad that you are able to still employ your workers and feed them during the day. Whenever my art work arrives, it will be a treasured and honoured piece in our home. Every time we look at it we'll think of you and know that it was made by strong and amazing people. I am happy to help in such a special way. I have made donations from here but it all seems so distant. C.B. My wife’s and my hearts go out to you, your employees, your families and the people of Haiti during this devastating disaster. I commend you for you are doing for your employees. My wife works for a corporation here in the US that will match our donation for relief to Haiti and we are doing that this week. I look forward to when we get our new art piece, it will be mean something very special to us. Our prayers and blessings are with you. You have our patience and our thoughts and prayers. I placed this order hoping that it would help create (in a tiny way) just the work opportunities that you are speaking about in your email, so I was very moved to read your news. My husband and I will continue to donate to agencies working in Haiti. 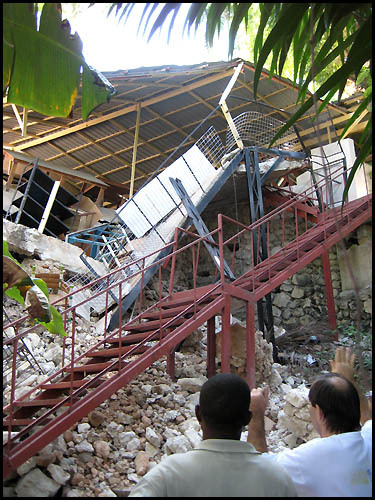 I am so very sorry to hear of all of the tragedy from the earthquake in Haiti. I am keeping you all in my thoughts and prayers. I have read on your website that you are still working to make metal art so the artists can support themselves and their families through this horrible tragedy. once it is able to arrive. simply lovely pieces of wall art instead. My own family's thoughts and prayers go out to you and yours. I am happy to hear that you are making a go of bad stituation. My heart goes out to you and the people of Haiti. Please take care of yourselves and those around you, I look forward to recieving the pieces, they will have a special meaning attached to them. WOW !!! I didn't realize you were in Haiti. We have been following the progress from here, and you are in our prayers & on our church prayer list as well. may god bless you & give you strength in this most desperate time.